love the trunk that is developing, over 20 years old now! Do you get any olives from the tree DD? It obviously likes where it is sited. Yes we do every year, but the procedure is far too labour intensive, so we don't bother with them!! Looks like a Paperbark Maple, interesting. Beautiful bark in such attractive colours. I too did not know that olive trees had such an interesting bark. 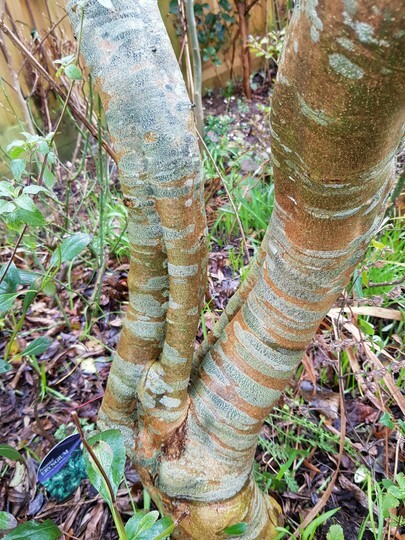 I love the stripy bark too. You are being rewarded for your patience Dd , the one reason I didn't like moving was leaving all my mature trees& shrubs behind it takes years to see them at their best .. Fascinating to see an Olive tree with striped bark! I saw 1,000s of Olive trees in Spain but never did I see any with striped bark! Must be one specially chosen for it whereas the ones I was used to seeing were for harvesting their fruit. Do you have any other Olive trees in your garden or nearby? I ask because they are wind pollinated & there would need to be more trees around for them to cross fertilize each other & produce fruit.